"This is our office. It makes me crazy. 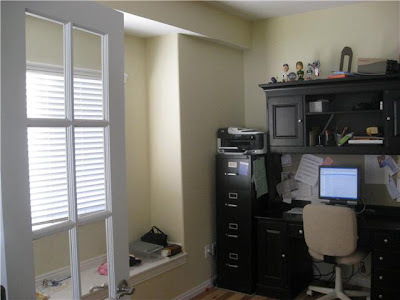 I would love to get rid of the bench under the window and put 2 small two drawer filing cabinets on each end with a desk top over. I'm not sure what I would use or exactly how that would work. 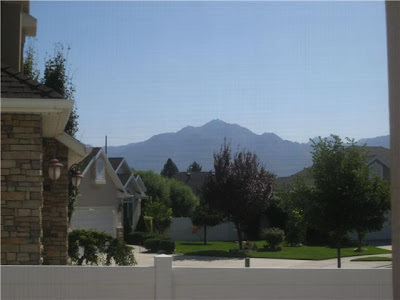 I live in Salt Lake City and that window is the only one we have that faces the mountains so it would be great to have a nice a big work surface and a view too. My goal is a fresh (maybe pops of green) clean looking office. A comfortable place to sit would be nice also. I'd love some input!" This would cost a lot more, hopefully you and your husband could do most of the work yourselves, and you would definitely want to think about all the storage you would lose by getting rid of your black desk. and it would be fabulous to put a fabric skirt around it so you would be able to have some storage underneath. 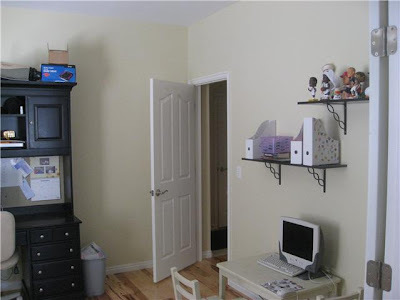 You could also be on the lookout for two matching shelves you could paint and use on the wall for storage, which would be much less expensive than built ins. and a furniture piece that stored your files like this one below? You could add a lamp on top to make it a cozy reading space with your chair. 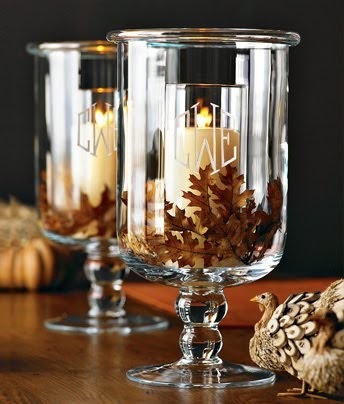 and add a cushion and some yummy pillows, like these from Crate and Barrel (you said green, right? Okay, I'm having way too much fun with ideas here and have to be on my way, but let's hear yours. 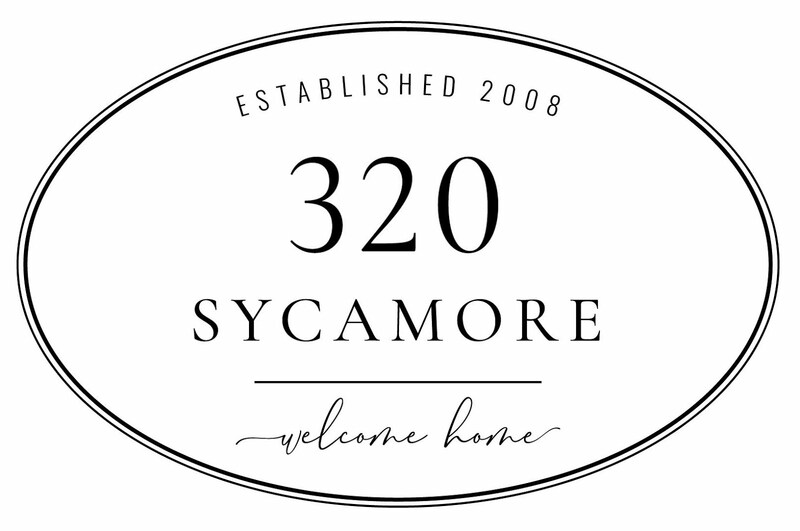 Y'all were great last time with your ideas, links to pictures, etc. and look how it turned out! 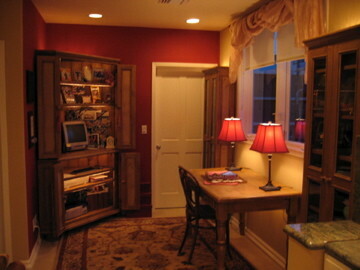 What ideas do you have for Karin's home office? For some reason I can't see the pic's of Karin's office.. is it me? No, it's not just you. I can't see Karin's office pics either! Melissa, you're such a tease. Oh, blast! Maybe they're too big...let me try to figure it out. Pictures are still not loading. Both Ikea and JC Penney.com have desk units where you can add a desktop with file cabinets. 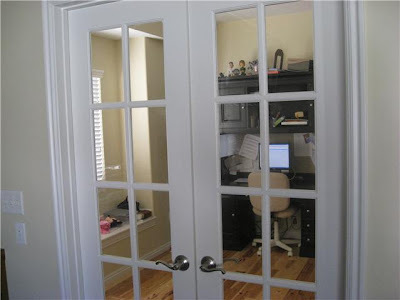 One option - She could use two wood filing cabinets with an old door as the top (Habit for Humanity ReStore has tons), paint them to match (a nice crisp white with the recessed areas of door painted a contrasting color) and then cover the "desk" with glass. Anonymous~ I love that idea!! AWESOME ideas! Great display of pictures showing options! (I especially love that office with the pale green walls, chandie,and the red rug . . . Be still my heart! Thanks Melissa! I love these ideas and especially find that white office inspiring. Can't wait to get started! Oh, I would keep the window seat & play it up big! 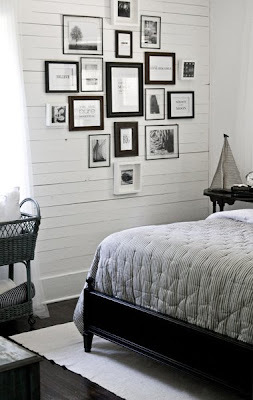 With rods & framed panels, lots of pretty pillows, like Melissa mentioned. Great space to work with! If it was me I would definitely keep the window seat! I'd add lot's of pillows and a deep cushion. If there's room for it I'd put a project table from PB in the middle of the room (lots of work space & you'd still enjoy the view) and then put a nice big wall of shelves and/or cabinets on the wall where her desk is now. I actually love the window seat. 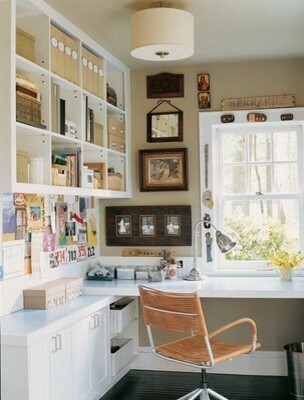 If you need more filing space what about adding filing cabinets in the window seat. 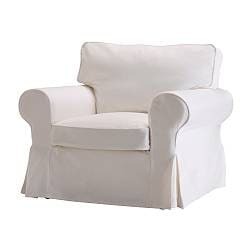 If you like the look of crisp white you could easily paint your black unit white (although it will take a few coats of paint) and I love the pops of green in the pillows. Cant wait to see what you do.